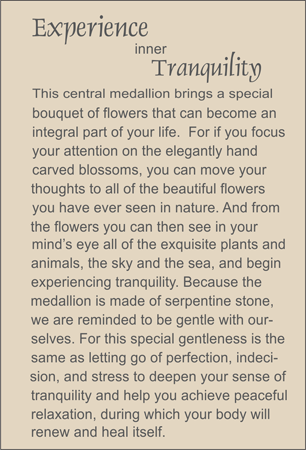 MEDALLION: Taupe-colored serpentine hand carved medallion presenting a flowering plant with blossoms in a Chinese vase with handles. ACCENTS: Yellow ambronite nuggets and small rock quartz crystal ellipses. COMMENTS: This is the hostess gift that will keep on giving.